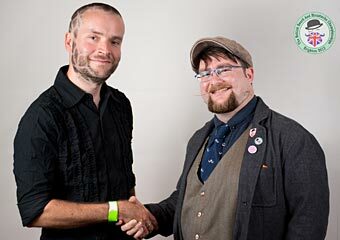 The British Beard and Moustache Championships held in Brighton on September 15th 2012 raised £2416 for charity and the donation was split equally between the Martlets Hospice and Macmillan Cancer Support. 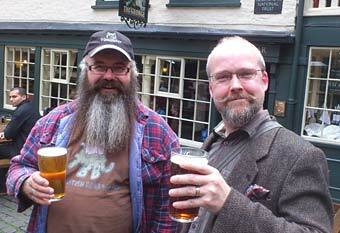 The first Gathering of The Wessex Beardsmen has been organized for Sunday 30th December, and is to be held at Ye Olde Poppe Inn, just outside Chard, Somerset, on the A358 towards Devon - easily accessible from all of 'Wessex' on the borders of Somerset, Devon and Dorset - and will start at 4pm. 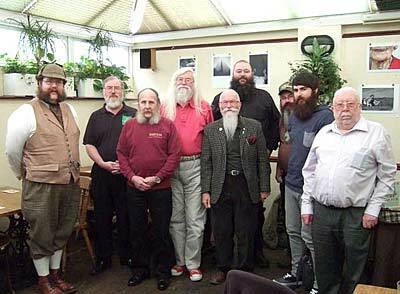 All members of The British Beard Club, their partners, children etc. 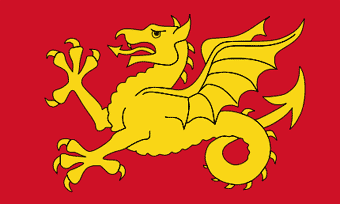 are very welcome, especially those living in 'Wessex'. 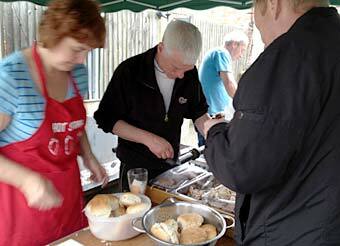 If you are not a member but would like to join the Club, come along and meet us. If you intend to attend or need more information please contact Andy Teague via the CONTACT US page. A fine full beard is on the brink of extinction! But you can help preserve it... Taylor Gehring of Fredericksburg, Virginia, USA has appealed for support. “My last day shaving was July 20th, 2012. Everday that went by without shaving I realized I was growing a nice full beard! Now my loving wife said it is coming off the 1st of the New Year. “ I have come to realize that my beard gets lots of attention. It gets compliments, nasty looks, advice, laughter, and many other kind of comments. As the days have gone by I fell in love with my BEARD! Well Mrs. Gehring, Taylor's excellent beard is certainly worthy of the attention of The British Beard Club, so we're inviting him to join us as an Overseas associate member. With international support like this, he must surely KEEP the BEARD? UPDATE! Taylor is now a fully-fledged (as you can see!) 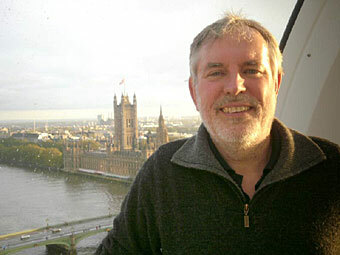 Overseas Associate member of the Club, and we are delighted that he has joined us. All readers of this page and members of this Club are requested to "Like" Taylor's Facebook page, blog about his plight and generally offer support, as you have done in the past. Together we can Save The Beard! 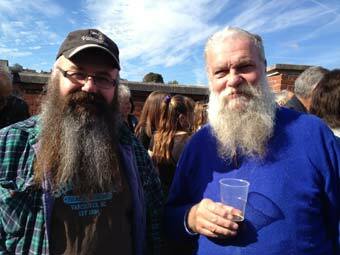 We've all been asked at one time or another if we'd shave our beards off for charity, and it's a difficult choice for a long-time beard grower. 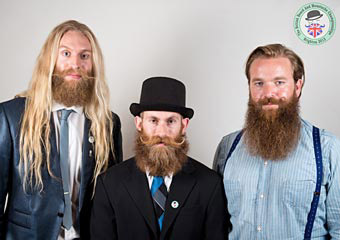 However, The British Beard Club is not going to ask any member to shave for such a reason — that must be your own decision. “One in four people are affected by bowel cancer, either directly or through friends or family. The second biggest cancer killer, it claims a life every half an hour, yet the subject is one of society's last taboos. Only by getting people to talk more openly about bottoms and bowels can we make them aware of symptoms and stop people dying of embarrassment. Unlike Movember, which does such an excellent job for male cancer charities but ends with a mass shavedown at the end of November, Decembeard are encouraging Beardys to keep their beards after the end of December, which is a great boost for our own cause. Here's a special Christmas Offer! 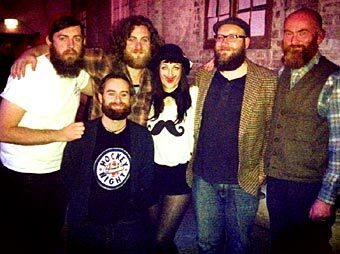 For every new member that joins The British Beard Club AND registers for Decembeard, the Club will donate £1 of the new member's half-year subscription to the beating bowel cancer charity. 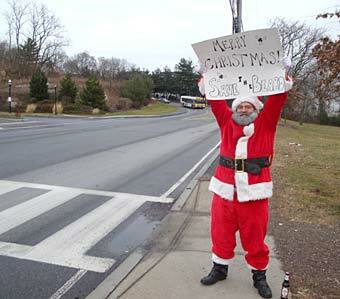 For more information about the charity and how you can participate, go to the Decembeard Web site. This might not be your usual Christmas if Selfridges have anything to do with it. 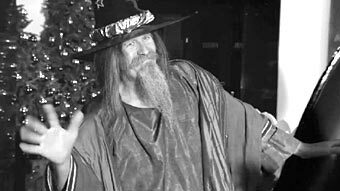 Their Christmas video by Bruce Weber features not only our one and only Wizard Frazer Coppin, but also one of our Handlebar Club brothers. Can you name him? 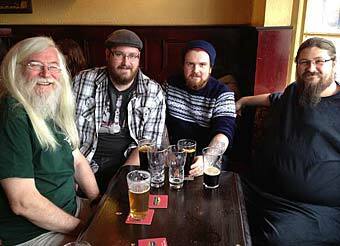 Esteemed member David Alcorn, Northern Ireland Regional Organiser and now doing an excellent job of promoting the Club in West Yorkshire at Leeds Metropolitan University, is bringing together student beard groups and local enthusiasts. 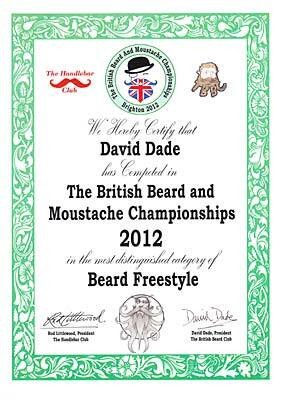 David competed in the Brighton BBMC in the Natural Full Beard with Styled Moustache category and when he returned to Leeds he was interviewed for The Yorkshire Evening Post and as a result David has been in demand by the broadcasting media. Yours truly was also asked onto Wes Butters' own show to follow on from David's appearance. A couple of weeks ago, David previously talked about beards, contests and grooming, and The British Beard Club to Brooke Burfitt, morning show presenter on Hayes FM, London community radio station. You can read the Yorkshire Evening Post article by clicking on the link below. Every contestant who took part in The British Beard and Moustache Championships 2012 in Brighton has been sent one of these handsome A4 Championships participation certificates designed by our talented artist/member Mike McCarthy. Mike's pretty Arts and Crafts style border design was inspired by Victorian book frontispieces, and each certificate features Mike's original drawing of the category style entered. 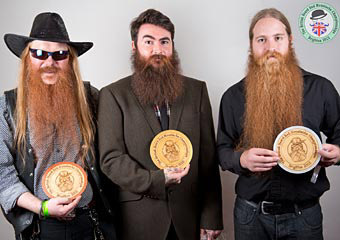 Each of the facial hair category Championship place-winners has also been sent a separate and different Winners certificate commemorating their success in the Championships. These feature a very attractive leafy border and boldly display the place attained. Both these certificates will be a lasting reminder of a memorable day for everyone who took part. 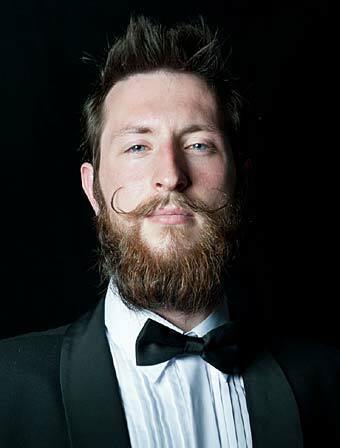 The first British Beard and Moustache Championships at Brighton Dome - Corn Exchange on September 15th 2012 was a sell-out success! 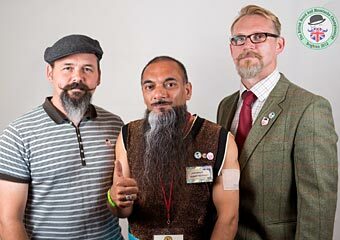 The two organising clubs, The British Beard Club and the Handlebar Club are astonished and delighted by the huge response and warm good wishes and thanks we've had from the hundreds of spectators and contestants who came to the event. It seemed like all the world's media photographers and camera crews had converged on Brighton to report the hairy happenings, which started with a noisy parade of contestants around the jewel of Brighton's Regency heritage, the Royal Pavilion. The Corn Exchange was full to the brim with cheering audience members, and everyone had a really great and memorable day they'll remember for a long time, and they have told us so. 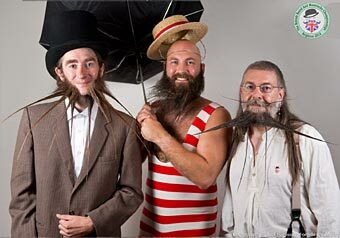 We saw a wonderful variety of facial hair styles, from the elegant through to the fantastic, and the competition was very stiff, which in many of the categories was quite literally true! 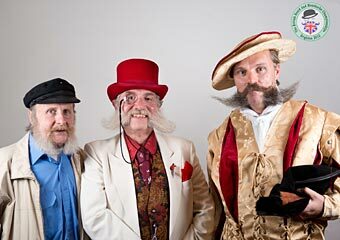 Britain's best Full beards and Handlebar moustaches were the most hotly contested styles and all the contestants in all the categories put on a really great show. 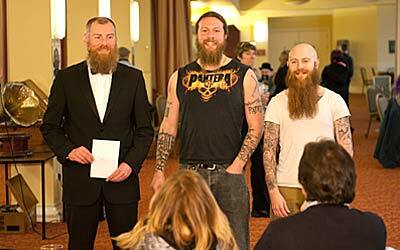 Members competing from The British Beard Club brought home nine trophies, including two 3rd prizes, five 2nd prizes and we have two new 1st prize British Champions; Frazer Coppin in Musketeer, and Andrew Balls in Natural Full Beard. Most honourable mentions are also due for Tony Ibbitson, Mark Fuller, Charlie Saville, Joe Elgie, Andy Casson, Guy Dinwiddy and George Lees. Visit the BBMC Web site soon for full Championships results and hundreds of photos and videos on the BBMC Facebook, Flickr, Youtube and Twitter pages. This year's annual visit by The Great British Beard Club to the Great British Beer Festival was a unique conjunction of aficionados of facial follicles, as we joined with our moustached brothers of the Handlebar Club for their first ever outing to the GBBF, this summer at Kensington Olympia, London. Featuring over 800 British and foreign beers, as well as food, music and beer-related paraphernalia, CAMRA's Festival is a well-established and extremely popular event. 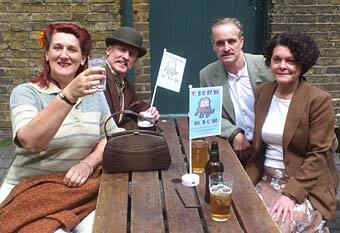 Members joined in with the St. George's day weekend celebrations at The Hope Pub, Carshalton, Surrey on Sunday April 22. 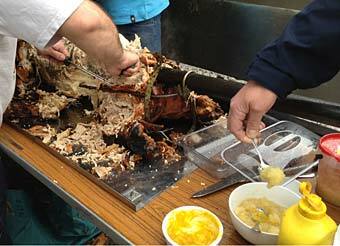 The main event of the afternoon at The Hope was a Dragon Roast! We were assured this was a semi-wild free-range Dragon of the highest quality, and that it was locally-slain! St. George himself was busy with other engagements so Rodger, one of the Hope's owners and member of TBBC, oversaw the roasting, and in due course, the animal was done to a turn (and it was it's turn to be done) at about 3.30pm. 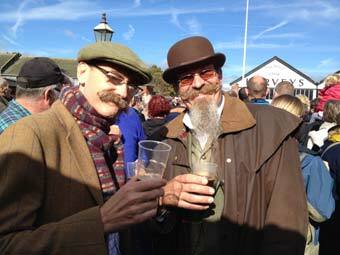 The usual subjects came up - Real Ale, Beer festivals, Beards, Tattoos, Snuff - Snuff? Well, genial host Rodger brought out an astonishing selection of tins of the snuff stuff, and although I was not tempted to try it myself, the same can not be said for many of the bearded brothers in these photos! 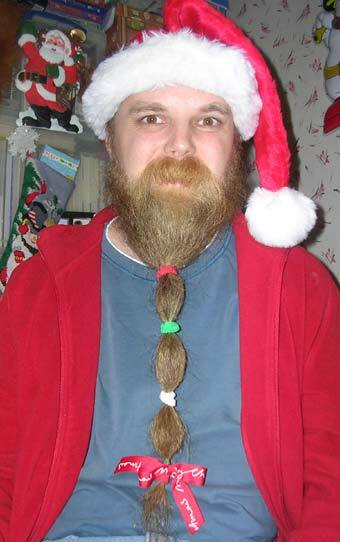 All you DecemBeard Beardys: Please Don't Shave! is 3 years and 10 months old. After all that hard work growing and getting everyone used to your new beards, why go though all the bother of shaving at the end of Decembeard when you could just keep growing your beard? 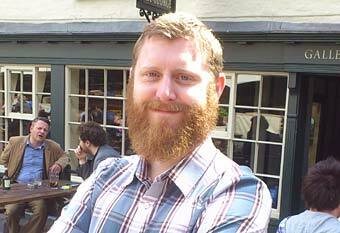 You know how much you've become attached to it, so don't shave your beard and next Christmas you'll be able to play Santa just like our member Paul Wright of Southampton, whose 1 foot 5 inch (431.8mm) beard is 3 years and 10 months old. Wednesday night of 19th December brought bad weather to Liverpool, but didn't dampen the spirits of The Liverbeards - our new local Club thatch - who met for their first gathering at turn-of-the-century pub The Phil in Liverpool City centre. “It was a horrible night for the weather but the Philharmonic Pub had the heating on full blast to compensate. 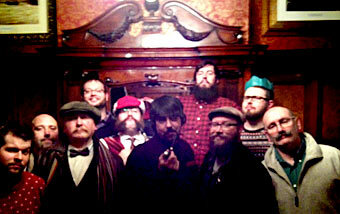 There was a great turn out from our fellow bearded gents including some old faces and new ones! “The smoking room within the pub that we chose to meet in was also taken up by a group of friends having their annual 'Xmas jumper and beard party'! It didn't take long for the two groups to join forces. 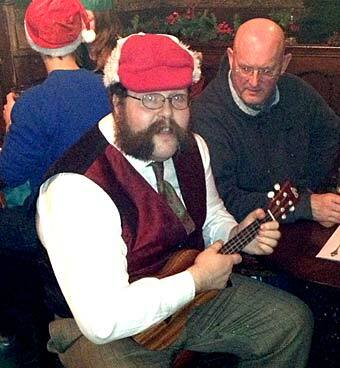 “Mycroft Milverton added a bit of Christmas cheer by serenading us with Yuletide songs on his ukulele. “Conversation went from the usual (weather) to the interesting (electronic pipe smoking) and to the strange - (dressing as mer-men for our group logo!). “We have decided to keep the meeting to monthly at the moment so our next is at 7pm on the 30th January 2013, again at the Phil. 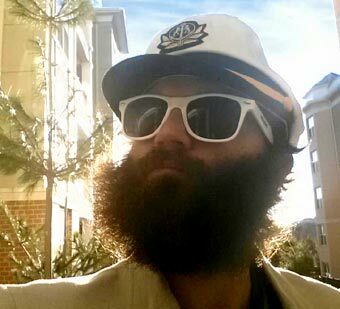 If you'd like more information from Drew Johnson about The Liverbeards please go to our CONTACT US page. 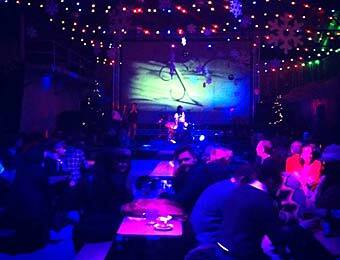 Tuesday December 4th was a miserable cold wet night but beardys and beard lovers of Liverpool gathered at Camp and Furnace to see a battle of the beards! 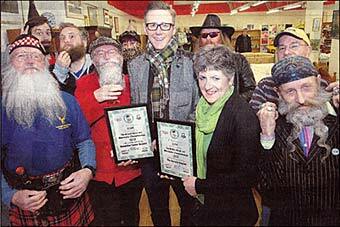 Jim Loftus took first place in the Best Beard category. Jamie Howie was named Best Moustache. 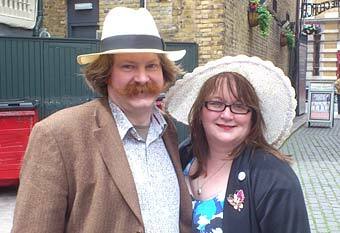 Mycroft Milverton took Best Sideburns and Clare Freeman impressed with her Best Fake. 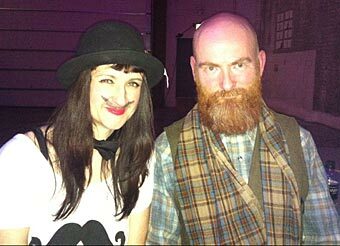 “Liverpool's first Beard and Moustache Contest at Camp & Furnace saw over 150 people gather to see what bearded delights are on offer in the city. “Just for fun, and FREE to attend and take part, the winners took away a goody bag including booty and beer from Camp and Furnace and Cains Brewery. 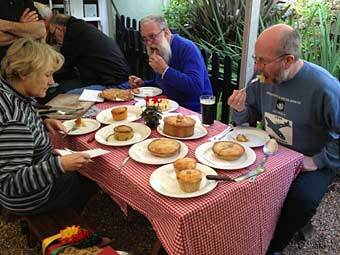 The winners will also feature in the Beerdfest 2013 calendar. Beerdfest in action with Jodie out front! The Standard Seven (L-R): Rodger, Phil, John, Clive, Frazer, George and David behind the camera. 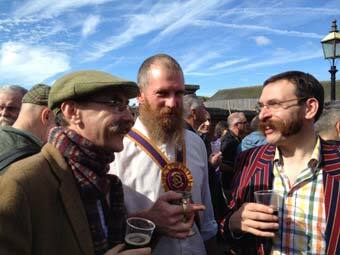 George Lees, BBMC 2012 prizewinner in the Sideburns/Muttonchops category, set up The Royal Standard, a Fullers pub in Croydon, Surrey for our next London lunchtime Gathering venue on Saturday 27th October. George was able to arrange with the landlady for lashings of tasty chilli-and-rice at £5 a head, and The Royal Standard served us well with Fuller's London Pride and Chiswick ales. George was hoping for a good turnout from our South London area members who are always asking when the next London meet will be. 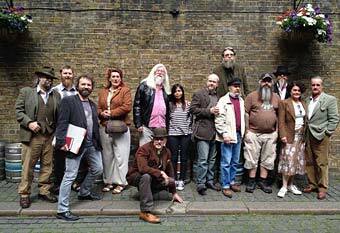 A good time was had by the stalwarts, and we're looking forward to our next Gathering in November. Where will it be? Bognor, Cambridge, Carshalton, Leicester, Wirral? You tell us where you'd like to meet, and we'll meet there! 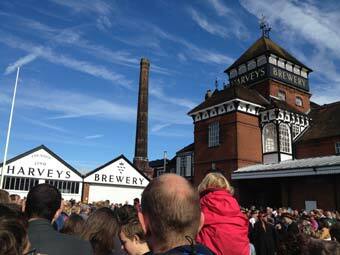 Our annual October Club Gathering at Harveys Brewery in Lewes, East Sussex was on Saturday October 6th, when we joined in on the occasion of their “Rolling Out the Old Ale” celebration of the release of their winter Old Ale brew. Like last year the event was blessed with good weather, and the crowd of on-lookers and beer tasters gradually swelled to the usual full-house. The Old Ale seemed smoother this year and a clog-dancing team featured on a special raised stage. Just before the beer ran out we started to feel peckish, so we left the Brewery yard and made our way to a new venue for the TBBC Lunch party, The Snowdrop Inn, a ten minute walk along Cliffe High street. 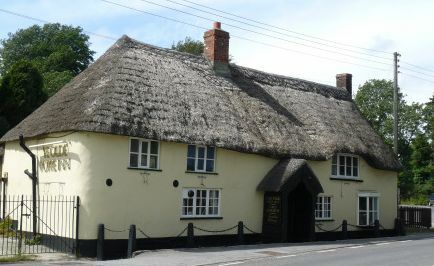 Lunches were ordered from their excellent menu, and we received several photo requests from other pub customers bemused by the profusion of beards and moustaches. 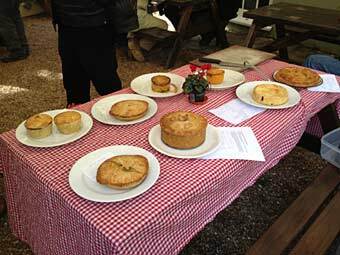 We also received a request for one of our number to join their judging team for The Snowdrop's Annual Piemaking Contest. Ross accepted the challenge and joined the other two tasters and although by now he'd already eaten lunch, he made room for a taste of each of the eight contenders. After a lot of deliberation and napkins, it was the raspberry pie that won the day unanimously! 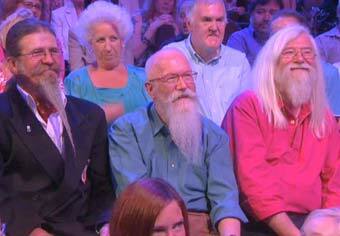 David tries to get a word in edgeways when Rob Brydon talks to members of The British Beard Club in his audience. Rob chatted briefly to all three of us and the whole audience gave us a big cheer, except the poker-faced couple behind us! Wear a Pith helmet and get free beer! 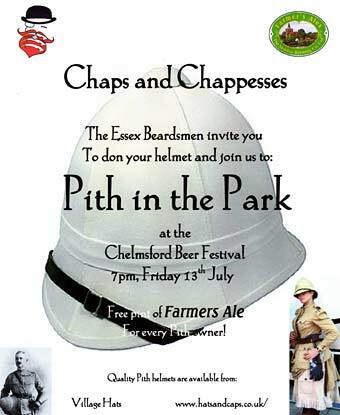 The Essex Beardsmen hosted this event on Friday evening, 13th July at Chelmsford Beer festival. Everyone entering the festival, carrying or wearing a Pith helmet was to be presented with a voucher entitling them to a free pint of Farmers Ales. We hear that the event was a great success, and pictures and impressions of the evening will be coming soon. 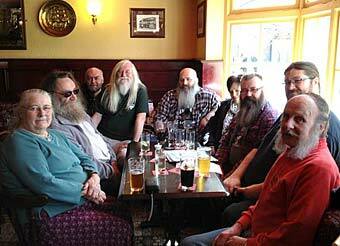 We are delighted that Keith Harber of South Wales accepted our invitation to join The British Beard Club. 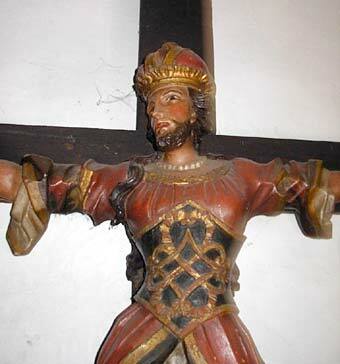 You may remember that Keith was refused a job interview because he has a beard. 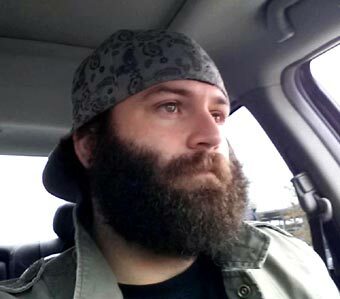 Now he's part of our united band of bearded brethren. Why not visit Carmarthenshire to sample its tranquillity and stunning views? You might even bump into Keith and join him for a pint! 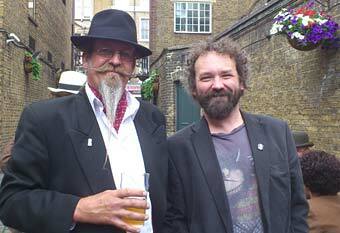 Our annual Midsummer Beardness gathering at The George Inn, which is London's last remaining galleried inn nestling in the shadow of the Shard, was a great afternoon. As usual, the collection of bearded and moustached men, some with their lady friends, wives and one camerawoman daughter, caused a ripple of interest among the other revellers, specially when it was time for the group photo, for which they were queuing up! We will probably find ourselves on many other unknown photo and Facebook Web sites! A full report will be online shortly. WE had a crop of new members join us at the Lord Nelson Inn in Brighton for Sunday Lunch, and a good time was had by all. The Lord Nelson's Sunday Roast menu was traditional and excellent - I had roast pork with all the trimmings, which was beautifully cooked and presented. Harveys beers went down a treat too. A real-ale-addict's visit to Brighton isn't complete without also calling in at The Evening Star pub, which is only a few minutes walk from the Lord Nelson and still within crawling distance from the station, so at about 4 o'clock we all repaired there for another pint or two. 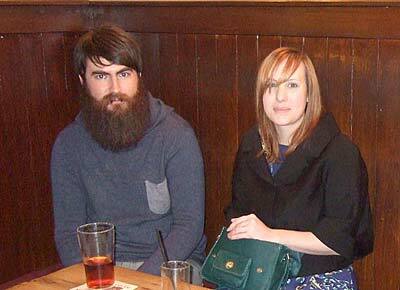 Two very non-local Club members had travelled separately down to Brighton that weekend to attend conferences. 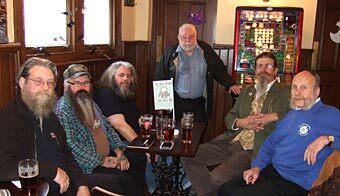 While "bristling burlesque beardy" TBBC member Baron Batholomew Black from Scotland was checking out The Evening Star with his conference colleagues, in the rest of us walked with TBBC member and conference delegate Mycroft Milverton down from Liverpool. 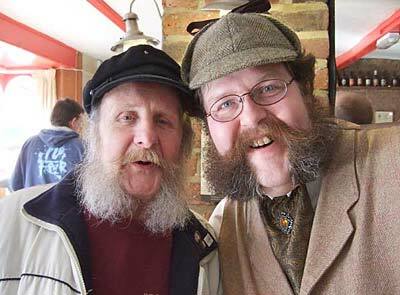 It turned out that the Baron and Mycroft were here for the same conference, so thanks to The British Beard Club Gathering these two delegates found they had several other common points of interest. 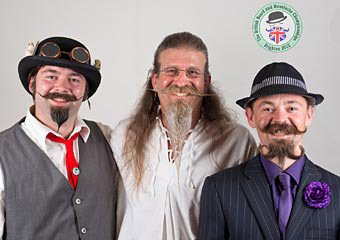 The Baron managed to evade the club cameraman on this occasion, but he is on the front page of the British Beard and Moustache Championships Web site wearing a top hat. 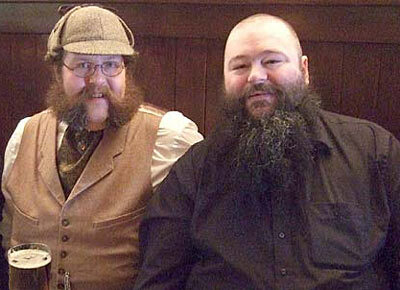 MARCH 4th's Bearding event organised by The British Beard Club at Scarborough Spa, North Yorkshire was a great success. Despite the dreadful weather, enough people battled through the rain to be present and make the whole occasion a fun and family friendly beard meet-up of the highest order. 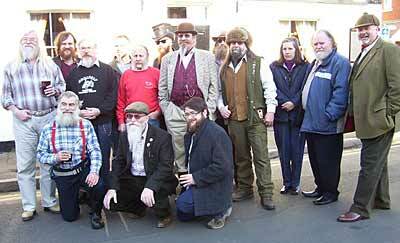 TWENTY-ONE hardy souls ventured out on a very cold February Saturday to The Queen's Head, Chelmsford, Essex, for The Essex Beardsmen's 3rd annual Winter Gathering. There were new and some familiar faces, some fine beers and conversation, a buffet lunch, and a shoot by a photographer from the Essex Chronicle.